I’ve been struggling to get some art routine re-established and hope that by taking advantage of the inspiration provided by Dawn DeVries Sokol’s web challenge Na(tional)No(nstop) Jou(rnaling) Mo(nth), I might just succeed in November. 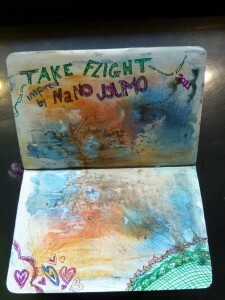 I’m new to art journaling but have been following some journaling sites and videos for a while so decided it might fit with my November schedule. I didn’t get a lot done this morning – had to break for the 9:30 walk into town – but may get back to it later. We are currently tucked in for the months of November and December at the N’Kmip RV Park at Osoyoos BC so should be able to ‘do art’ for a bit. I’m finding that when we are traveling a lot, handwork is better than ‘art’ work so have been rediscovering some skills learned in the past and neglected for a while. In the past I have knit a number of sweaters both for myself and for my family but had not tackled socks until I started to travel. Since 2009 I have completed four pair, the first two pair, traditional style with a ribbed cuff, are much loved and worn in the cooler months. 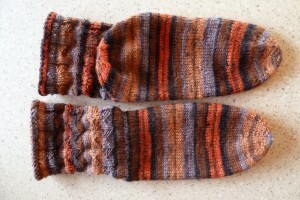 The third pair of socks was knit using a pattern with a short row heel which I liked but which didn’t fit me as well as other heel styles – (Nutkin sock pattern found on Knitzi.com). I followed the pattern and found them to be a very tight fit – designed for a more feminine foot than mine. They were a Christmas gift to my daughter-in-law who has a much smaller foot. However I loved the mock cable design in the pattern and the yarn I used (sorry, forgot to take a picture) and searched for more yarn this fall but couldn’t find the same color mix. This fall I purchased a book “Personal Footprints for Insouciant Sock Knitters” by Cat Bordhi and just loved her toe-up approach to custom fitting a sock. The socks above are my newest pair and were knit using her instructions on 3mm needles with Kroy sock yarn that I picked up for 97¢ a ball in a clearance at Michaels. Figured I couldn’t lose at that price! $2 plus change with tax for a pair of socks! For the cuff I did my variation of the inlaid pennants pattern (pg.45) – I add six rows of plain between the pattern repeats and as a result the cuff scrunches down into a series of rings when worn. Because I used a larger needle than usual I had this pair finished in a week. Hope it doesn’t affect the wearability but I didn’t want to spend a lot of time on them as they were a ‘learning’ project and I wasn’t sure about the colorway – which I now love! My current project is another pair of ‘$2 plus change’ socks in a different colorway, this time knit on 2.5 mm needles and based on the Nutkin sock pattern but with a different heel design from “Sock Knitting Master Class” by Ann Budd. I also substituted a narrow ribbed top rather than the fold-over in the pattern but more on that to come when I get to the photography stage.